The card game of Solitaire has a very blurry history with no actual ‘inventor’ as such though card games of this type are thought to be of French origin. The game, also known as Patience is thought to have been a favourite of Napoleon Bonaparte. The great thing about Solitaire is that you can play it alone. That is not to say playing games with other people is not fun, of course it is, but Solitaire can be carried in your pocket and played with ease anywhere you have a playing surface. This single play approach is probably why it was chosen as a Windows game for PCs. Solitaire utilises a regular deck of cards, with the jokers removed. The overall idea is to shuffle the cards, place the cards in a particular arrangement on the playing surface and then place other cards, in order from the deck, onto these in numerical order until all cards are face up. To set up Solitaire simply shuffle a standard card deck (with jokers removed). On a flat surface deal out a horizontal row of seven cards, making the first one in the row (i.e. on the left) face up and all others face down. Repeat this making a new row on top of the row you’ve made, but leaving out the first one and only using six cards. This will leave you with one card in the first row, and two in all other. Two cards should now be face up and the others all face down. Continue with this process until there is a card face up on each pile. When done correctly you will end up with 28 cards on the table and one card extra in each pile until the top card is face up. The rest of the deck is placed face down in front of you as these will be used in play. If any ace cards are showing in those you’ve dealt these are known as the foundation cards and are the basis of how the cards will be removed from the table and out of play. Remember the idea in Solitaire is to remove all of the cards from play. Place any aces above the row you have made and turn over a card beneath any aces removed. This pattern is how play continues in alternating colour and if you can’t place any cards showing you turn over a card from the deck. If a king is showing it is removed to the ace of the same suit. Cards placed on the foundation cards must have suits that match. This is contrary to the cards in play in the seven rows as these must have cards placed on them in alternating colour (suit doesn’t matter) working the way down numerically. So for example if an eight of clubs is showing and you also have a seven of hearts showing, you may move the seven across and place it on top of the eight. Then you would turn over the card that was originally under the seven and so on and so forth. You continue playing with the aim of getting all sequential cards out in alternating colour. Many players will sit the ace’s at the top of the game area and build on them from two upwards rather than placing the king onto them. In this style of play, the king is uses as the foundation card and can be moved around. Due to the many number of variants in solitaire, the way the game is played can differ immensely. Scoring in Solitaire doesn’t work in scores as such, given you are only playing against the deck and no other opponents. The thrill of the win comes from removing all cards up onto the foundation cards. As mentioned, there are so many Solitaire variants that they’re impossible to list. Some of the more popular and well known variations include Accordion, Amazons, Alhambra, Alternation, Bakers Dozen, Baroness, Bisley, Black Hole, Black Widow, Blockade, Blue Moon, Braid, British Square, Busy Aces, The Canfield, Captive Queens, Carpet Version, Castle of Spain, Chess Solitaire, Citadel, Clock (played in a circle), Clown, Colours, Concentration, Congress, Corners, Courtyard Solitaire, Crescent Cards, Cribbage Solitaire, Cruelty, Dead King, Deuces, Diplomat, Duchess, Duke, Eight Off, Elevator, Elevens, Exchange, Faerie Queen, Fifteen to Win, Fire and Ice, Florentine, Forty Thieves, Four by Four, FreeCell, Gay Gordon’s, Giant, Golf, Granddads Clock, Grandma’s Patience, Great Wheel, Half and Half, Heads and Tails, Japanese Solitaire, Joker Free, Joker Pyramid, Just For Fun, King Albert, King of Scotland, Kings Cross, Klondike by Threes, Knaves, Labyrinth, Lady Betty, Lagoon, Legion, Line Up, Loser, Maria, Maze, Milky Way, Monte Carlo, Museum, Napoleon, Nestor, Nines, Ninety One, Number Tens, Odd and Even, One-Handed, Open Start, Osmosis, Parallels, Patriarchs, Peek, Penguin, Puss in the Corner, Pyramid, Quartets, Rainbow, Rank and File, Red Moon, Regal Family, Royal Ranks, Royal Square, Russian Solitaire, Scarab, Shuttle, Simplicity, Six by Six, Sly Fox, Solitaire Showdown, Spider Version, Square, Steps, Strategy, Sultan, Tens, Terrace, Thirteen’s, Three Hills, Tournament Solitaire, Tower of Hanoi, Travellers. Twenty, Up or Down, Virginia Reel, Wasp, Westcliff, Whitehead, Yukon, Zodiac. There are a few things whilst playing any game of solitaire that you must use to ensure an effective winning strategy. Firstly, always remember to play your ace whenever you can. Don't wait around, play it immediately and this also counts for a deuce if you are using certain rules. Also, you must always play or transfer a card which allows a down card, do this first before any other move. In line with this, play the card that frees up the down card from the biggest pile of down cards. In solitaire you will often move piles of cards around, but only do to allow a down card to be free or to make the columns you've built smoother. Some people make the mistake of clearing out one column without having a king to place into it. Try never to do this, always have a King waiting to be placed in this situation. 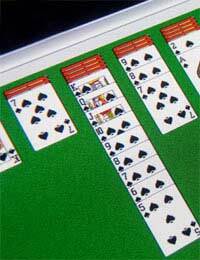 There are other strategies that help when playing solitaire, but they are very in-depth. Try to remember only to build your ace stack if it doesn't interfere with your next card protection, and don't play a 5,6,7 or 8 anywhere unless it will allow a play of transfer that will immediately free a down card.